Make a beeline to Houston&apos;s buzzy Central Business District--home to pro sports teams like the Astros, Rockets and Dynamo, as well as year-round performing arts companies. Thanks to a recent resurgence, the district enjoys a following that extends well beyond the 9-to-5. Settle in at one of downtown&apos;s prime properties offering more than 5,000 rooms, where top-notch amenities and luxury accommodations make guests feel right at home. In addition to the 1,203-room Hilton Americas-Houston, adjacent to the George R. Brown Convention Center, there are four other hotels within five blocks of the convention center, including the 404-room Four Seasons Hotel Houston, 262-room Embassy Suites, 201-room Inn at the Ballpark and 112-room Holiday Inn Express. Adjacent to the George R. Brown, the three-year-old Discovery Green park offers 12 acres of inviting green spaces and gardens. The area is complete with free-WiFi, event spaces, jogging trails, an amphitheater and two restaurants. Three of the city’s most popular sports venues are just a short walk from the George R. Brown Convention Center. The Toyota Center hosts the NBA Houston Rockets on the hardwood, while nearby Minute Maid Park plays home to the MLB Houston Astros. Downtown&apos;s newest stadium, BBVA Compass Stadium, hosts the MLS Houston Dynamo. With four major teams showcased Downtown, it’s easy to find pro sports action any time of the year. It’s no secret that Houston is overflowing with much-sought-after culinary gems, and Downtown offers one of the best places in the city to experience those delicious dining opportunities. Some of the area’s most beloved restaurants are just steps from the convention center, including The Grove in Discovery Green, Vic & Anthony’s and Four Seasons’ Quattro. Stop by GreenStreet, too, where more dining options await, including Guadalajara del Centro and III Forks Steakhouse. Stay late at the Pavilions for a show at the House of Blues, a game at Lucky Strike or a dueling piano competition at Pete’s Dueling Piano Bar. The 17-block Theater District is home to the Houston Ballet, Houston Grand Opera, Houston Symphony and Alley Theatre, among other talented performing arts groups. Last spring, the district welcomed the Ballet’s Center for Dance — the largest dance company facility of its kind in the United States. Grab a bite at Artista inside the Hobby Center for the Performing Arts, or head over to Bayou Place for additional dining and nightlife options. Near the Theater District, Tranquility Park pays homage to NASA’s lunar missions and features majestic cylindrical fountains and a series of angled walkways, as well as a stunning view of the skyline. Blocks away, Sam Houston Park serves as an outdoor tribute to Houston’s history with a collection of buildings illustrating eras of the past. Nearby, Buffalo Bayou Promenade features meandering trails with artful lighting along the western edge of Downtown. The newly renovated Market Square Park, a block away from trendy Hotel Icon, provides a place for entertainment, dining, public art and green space. The uber-popular Greek eatery Niko Niko&apos;s has set up shop in the park with a walk-up kiosk for breakfast, lunch and dinner. Some of downtown’s oldest and best-loved restaurants and bars, including La Carafe and Warren’s Inn, border the park, along with newcomers like the OKRA Charity Saloon. Main Street’s nightlife offers everything from dance clubs and luxe lounges to art inspired dive bars and romantic retreats—all of which can be easily navigated via the METRORail system. Find plenty of cool jazz and great food at Sambuca. Sample pints at Flying Saucer Draught Emporium, Shay McElroy’s Irish Pub and Dean’s Credit Clothing. South of Downtown — in the Midtown area — cafés, locally-owned shops and a booming nightlife scene are easily accessed via the METRORail. On Saturday mornings, locals flock to the area for locally-grown produce, organic coffee, freshly-baked breads and Texas cheeses at the Midtown Farmers Market, but after the sun goes down pretty young things return for wild nights at Midtown’s lounges, dance clubs and dive bars. A few blocks farther, the quirky and tree-covered Montrose neighborhood is a pocket of eccentricity and diversity in the heart of the city. Spend an afternoon perusing one of Montrose’s art galleries, grab a bite at one of the city’s best restaurants or find one-of-a-kind treasure at an offbeat shop along the Westheimer Curve. Northeast of downtown sits a section of historic neighborhoods that date back to the late 1800s. Residents once flocked to the area to escape the big city, but today it’s the hipsters and young couples that are drawn to its rich and character-filled architecture, mom and pop-type shops and funky restaurants. Find something you never knew you wanted at one of 19th Street’s quaint boutiques. Thrift stores, antique havens and cafes prove to be popular at the Heights-strip. Stop by for the “First Saturday Arts Market” on the first Saturday of each month for live music, crafts, plants and artwork. A glittering, fresh-faced crowd swarms this eclectic mix of luxurious lounges, honky tonks, wine bars and some of the most-loved restaurants in the city. The strip, which stretches east from Memorial Park to downtown, recently experienced a resurgence, as dilapidated properties were torn down and replaced with townhouses, mixed-use developments and high-energy hot spots. After the sun goes down, catch a seat on the Washington Wave—Houston’s first ‘jitney’ shuttle in more than 15 years. The taxi-bus concept enables riders to enjoy a fixed-route, fixed-rate shuttle within the Washington Avenue District, Midtown and the Heights. Close to a wealth of hotels, restaurants, and fun-filled diversions, NRG Park is just a short drive or rail stop from top shopping, dining, nightlife and golf destinations. The immediate NRG Park area (just 7.5 miles from Downtown) is home to more than 1,200 hotel rooms, including the 655-room Crowne Plaza and 238-room Holiday Inn. Give the car a brake and let the city’s 7.5-mile MetroRail handle all of the legwork. Set along Main Street, the wallet-friendly rail ends on the NRG Park campus, connecting riders to Downtown, Midtown, the Museum District and the Texas Medical Center. Catch the line and take advantage of its proximity to more than 70 dining and nightlife options, professional sports arenas and cultural institutions. Just two miles away, Rice Village offers sidewalk cafés, fine dining and nightlife options in a concentrated, pedestrian friendly area. Here upscale restaurants like Benjy’s and Prego live alongside casual eateries, including Mi Luna and Black Walnut Cafe. A host of happy hour havens fill Morningside Drive, while other distinctive bars are scattered throughout The Village. Adjacent to Hermann Park is the internationally renowned Texas Medical Center, the largest medical complex in the world. More than 49 institutions, including M.D. Anderson (the world’s top cancer research hospital) and St. Luke’s Episcopal Hospital (recognized as a top 10 U.S. hospital for heart surgery for two decades) call the area home. It comes as no surprise that more money and time are devoted to medical research in Houston than any other city in the country outside Boston. Straddling the 610 Loop is the Uptown/Galleria area. Here, a concentration of hotels with more than 7,400 rooms, fine restaurants, and sophisticated shopping venues gives the area cosmopolitan flair. The famous Galleria shopping mall brims with 375 shops, including anchor stores Neiman Marcus, Saks Fifth Avenue, Nordstrom and Macy’s. Nearby Uptown Park is another notable shopping destination that features a fun mix of shops, dining and nightlife in an outdoor village setting. 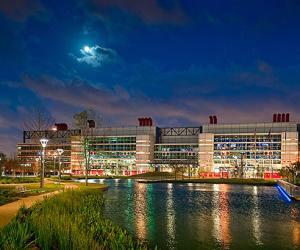 Less than three miles from Reliant Park lies the leafy and nature-filled Museum District. Eight million visitors flock to the area each year for afternoons spent exploring the 18 world-class institutions that call the area home. There, they can explore art, history, science, and more at the Museum of Fine Arts, Houston, The Menil Collection, Contemporary Arts Museum Houston, Children’s Museum of Houston, The Health Museum, Holocaust Museum Houston and more. Close by, in the 400-acre Hermann Park, sits the Houston Museum of Natural Science and Houston Zoo, as well as walking trails, biking, picnicking areas, an 18-hole golf course and Miller Outdoor Theatre. Also located in the Museum District is the stylish 315-room Hotel ZaZa. Venture over to the lush and luxurious River Oaks area, where some of the most coveted (and expensive) real estate stands in the city. While you’re there, visit Museum of Fine Arts’ two house museums: Bayou Bend and Rienzi, both of which feature impressive collections of art and antiques. Close by, art galleries and restaurants abound. Look for galleries along Colquitt and Lake streets and fine dining mainstays such as Tony’s.